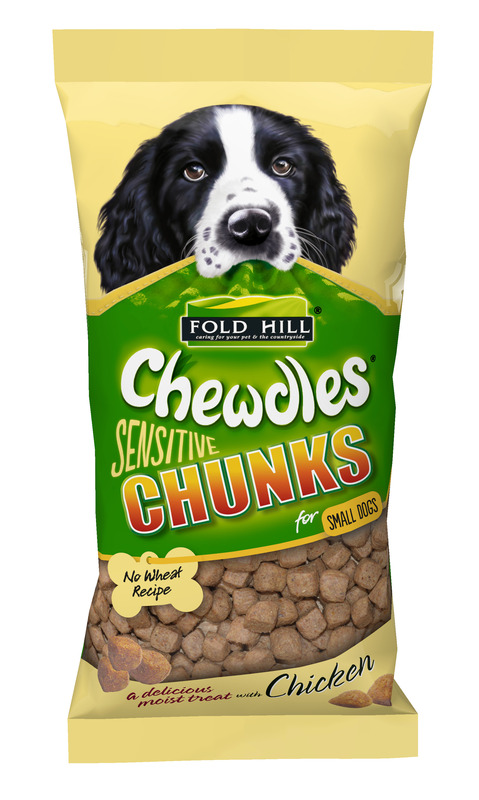 Fold Hill Chewdles Sensitive Chunks are a semi-moist treat for small dogs. Ideal for those which are sensitive to wheat. Great training treats. Colourants; Preservatives; Nutritional Additives (Kg): Vitamin A 12000iu, Vitamin D3 800iu, Vitamin E 60mg, Ferrous Sulphate Monohydrate 267mg, Zinc Sulphate Monohydrate 111mg, Manganese Oxide 78mg, Cupric Sulphate Pentahydrate 52mg, Sodium Selenite 7.5mg, Calcium Iodate Anhydrouse 2.3mg. There are currently no questions for Fold Hill Chewdles Sensitive Chunks Small Dog Treats - be the first to ask one!